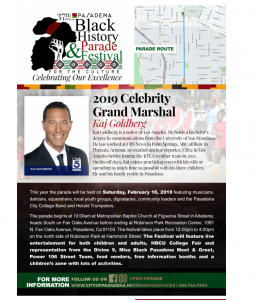 One of Southern California’s largest Black History parades begins at 10:00 a.m. at Metropolitan Baptist Church at Figueroa St. in Altadena; heads south on Fair Oaks Ave before ending at Robinson Park Recreation Center (1081 N. Fair Oaks Ave.). Stay and Enjoy the Festival at Robinson Recreation Center from 12:00 p.m. to 4:00 p.m. The Festival features live entertainment, HBCU College Fair, community booths, special guests, food to purchase and fun! Proudly coordinated by the Black History Planning Committee, and the City of Pasadena’s Human Services and Recreation Department. For event information, please call 626-744-7300.